I first saw Christine Camm on Instagram and knew that I had to know her story. 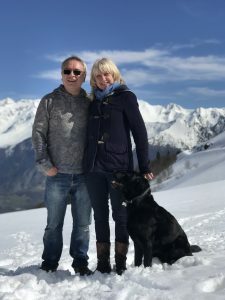 Christine and her husband Mark (along with their dog Leo) love to ski and wanted to be able to see mountains from the bedroom window of their new house! “So I drew a line along the Pyrenees, the mountain range in the southwest of France, and we started searching,” Christine says. It took three years but they found what they were looking for in the tiny village of Pujo, about two hours south of Toulouse. “Pujo is so small that it has only one shop,” says Christine. 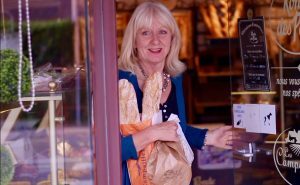 “And it is simply the best “boulangerie” in the world!” says Christine. 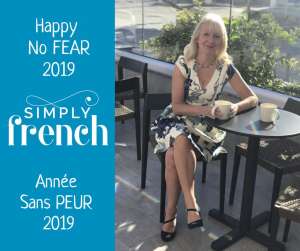 Now, from her new home, (and steaming coffee and crusty baguette by her side) Christine conducts Online French Lessons in a business she calls Simply French Online. 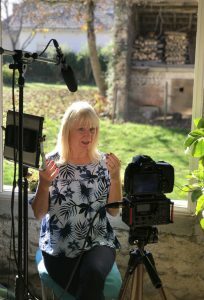 Christine teaches students from all over the world and says anyone can improve at any age using a process she has developed called The Real French Method. 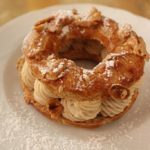 This is way of teaching French that allows you to creatively and confidently engage in conversation right at the outset. 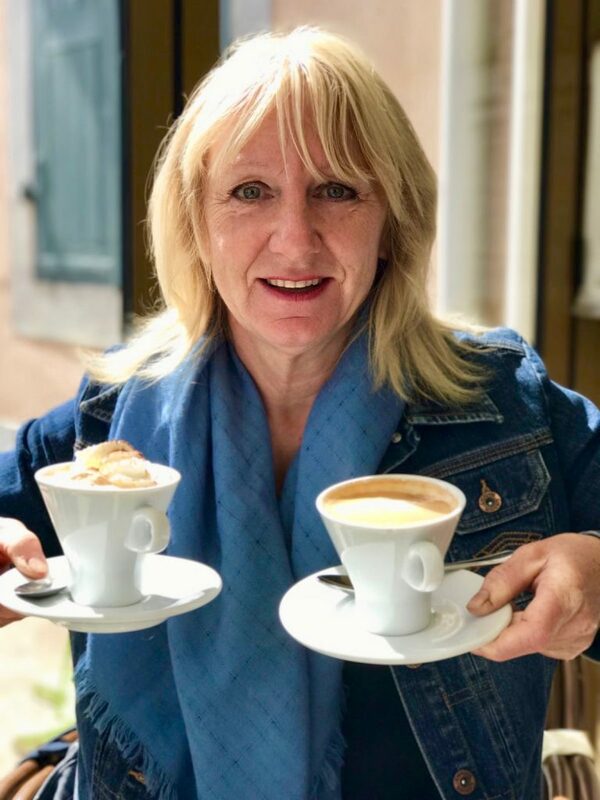 “It’s about developing spontaneous French speaking to learn vocabulary and grammar as opposed to rote learning using memorization and repetition,” Christine says. In other words, you don’t have to be shy about speaking French. You know more than you think you do. And Christine makes it fun! with a retail value of $110 USD/$150 CAD/£84! Thank you Suze! You are entered in the draw! Off to Paris in August, ’19. Thank you Sandy. How fun! You are entered in the draw! Thank you Susan — you are entered in the draw! Bonne Chance! You are entered to WIN Dorothea — and thank you for reading my blog! I really appreciate the support! How fun! Yes, we can all brush up on our French right? Your name has now been entered to win Trudy! Thank you for reading my blog! 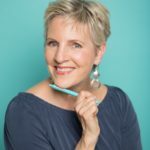 That’s super Michelle — thank you for supporting my blog! Your name has been entered in the draw! Pujo looks adorable but I wouldn’t want to stay in a village that doesn’t have at least a grocery , though coffee and baguettes are a good start. Unless there is a larger town close enough to cycle too, without huge hills in between! No, I’ll leave that offer for others, but would be interested in an intermediate to high-intermediate Spanish course on the other side of the border. My Spanish isn’t bad, but the Italian keeps creeping in. I would certainly love to live somewhere the snow stays politely high in the mountains. Weather bomb here in Montréal. Trudy, in the meantime get in the habit of listening to Radio-Canada at home. And nowadays you can read many things online, though Le Monde does have a paywall and not a lot of free content. Once a week Radio-Canada has top news stories from different French-speaking countries, which will expose you to different accents and to some extent vocabulary. I am interested!!!!!!!!!!! I took 6 years of French, but that was 18 years ago. My dream is to take my whole family to France one day. But it’s been so long my confidence in the French language is almost non-existent. I’d love to take these courses! I am interested. Actually I have been wanting to do this for awhile, seriously. You are entered to win Maggie! Thanks for reading my blog! Wonderful Peg! You are entered in the contest! I am interested! Of course! Delighted to hear from you and you are entered into the draw! I am soooo interested!! Thanks for the great offer. Thank you Lori. Your name has been entered! Thank you for supporting my blog! Titre Basque : Spanish recipes from San Sebastián & beyond / José Pizarro. Éditeur Melbourne : Hardie Grant Books, 2016. In the Mtl library system! By the way, I agree with Christine about songs for French learning. Lagatta, Thank you for all this useful info. I too would prefer a bigger place to live in the South of France.. maybe AIX which I do love. Spain too is on my radar for next year — Lord willing. Valencia! I am interested! Now that I’m living in Ottawa this would really help. That’s great Hope! 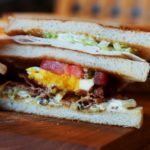 You are entered to WIN! Thanks for subscribing to my blog! and subscribing to my blog. Evie —- thank you for applying. Your name has been entered to win. Wonderful Michelle! Thank you for reading my blog and joining my community. I am interested. What a wonderful opportunity! I love reading your blog every Sunday morning. Your entries are delightful and happy, and they always give me a dose of happy too. morning routine, wow. that means a lot to me. Bonne chance ma chere amie! Great Dorothy! I wish I could offer a free trip — maybe later! You are now entered to WIN. Thanks for entering and reading my blog! Thank you for your comment! I am glad you are enjoying my blog. Means a lot to me to hear from readers. AND you are now entered to Win for the Free French lessons! Bonne Chance! 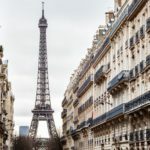 Lesley — thank you for joining my community of women who love Paris! Your name has now been entered to win the two Free French Lessons! I look forward to the draw on March 15th. Bonne Chance! PS More Giveaways to come! I am interested! But am I too late?? 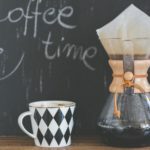 Have just come across your interesting blog! Hi Barbara — thank you for reading my blog. Yes, sadly, the draw was yesterday and I will be announcing the winner in my weekly blog tomorrow morning. But never mind, another fun Give-away is just around the corner. Stay Tuned!